The manual does list the names of the various halls and churches, etc, where IR's were created for Spaces II. But there's not much other information on them. I'm especially interested to know which Sacred Heart cathedral was used for that collection of IRs? From the photo, it looks like it might be the Sacred Heart Cathedral at the University of Notre Dame, but I can't quite tell. Can someone from EW verify the location of that particular church? If it is the one at Notre Dame, I'm thrilled...I always thought that would make a great collection of IRs for a convo reverb. I have a similar question for the San Francisco Hall, which has been my go to reverb for years. I always thought it was the SF Davies Symphony Hall, but the picture is from a different hall. And it's also not the War Memorial Opera House (with the very recognizable chandelier hanging from the rooftop). Or the SF ballet. Yeah, it would be great to know what exact churches and halls were used, as there may be some that users will know first hand. I just assume the photos are of the actual space, but perhaps not. Many of the halls and churches are recognizable, e.g. the Davies Hall (SF Symphony), Grace Cathedral in SF, the War Memorial Opera House in SF, the Benaroya Hall (EWQLSO Hall, where the original Symphonic Orchestra and Symhonic Choirs were recorded, which was a public secret for many years). Obviously the EW Studios are pretty recognizable as well. But it would be nice to have a list of the actual locations. I agree. Is "S. Cal. Hall" the EWQLSO hall? Would love to know to get a better sense of the room. "In theory there is no difference between theory and practice, but in practice there is." Polywell-built PC with Intel Core i7x980 at 3.33GHz 64bit -Windows 10 Pro 64bit. Maybe they're all secret locations. No one from EW has responded with further info on these locations. In the past, I believe Nick has told people here and on other forums that their licensing agreements with the location's owners sometimes prevents them from naming the space. Hi Peter5992, I'm curious as to what reverbs you used for brass with the other San Francisco Hall reverbs? Thanks for all info! https://www.scfta.org/Plan-Your-Visi...cert-Hall.aspx "S. Cal Hall" - Renee and Henry Segerstrom Concert Hall? Yeah, that's definitely a match. 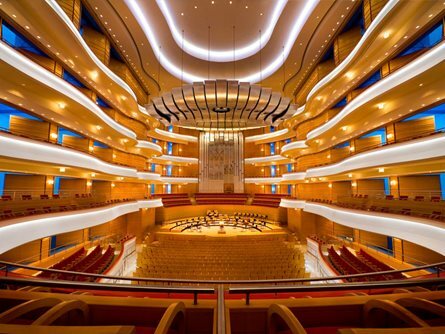 The Renee and Henry Segerstrom Concert Hall are in Orange County, definitely Southern California.